Travel between different universes can be a tricky thing. Sometimes, time passes more quickly in your home universe, so that when you return from a trip to another one, everyone you know is dead. Other times, you can spend weeks, months, or even years in another world and come back only a short time after you left. Sometimes, however, the relative movement of time isn't that consistent. You might be able to re-enter your universe at any point you choose, effectively combining dimensional travel with Time Travel. Other times, the relative flow of time between the two universes is out of your control: you might return at the exact moment you left, hundreds of years in the past or future, or anywhere in between. And the next time you make the same trip, the results might be radically different. These time jumps could be random, or they might be revealed to serve some higher purpose or destiny. This is Narnia Time, when the relative flow of time between two or more different universes changes to serve the needs of the plot. May include or contrast with Year Inside, Hour Outside and Year Outside, Hour Inside. Can also cause Time-Travel Tense Trouble. See also Timey-Wimey Ball. Compare with San Dimas Time where time passing in the "home" universe is equal to that experienced by the time travelers. In Vision of Escaflowne, the relative flow of time between Gaia and Earth seemingly follows no logic whatsoever. At first, time seems to move at roughly the same speed in both worlds, and traveler Hitomi is even able to receive a page on Gaia at the exact same time it was sent on Earth. Then, time seems to be moving faster on Earth when it's revealed that Hitomi's grandmother traveled there as a girl at least thirty years ago Earth time, but only enough time had passed on Gaia for Allen to age from a youth to a young man (perhaps ten years max). Then, when Hitomi returns to Earth, she is transported to a point before she even left, which is about where you stop worrying about it. Yuu Watase has gone on record as saying the time difference between the real world and world of The Universe of the Four Gods in Fushigi Yuugi depends on the text in the book, meaning that time doesn't move at a fixed rate - a few paragraphs could cover minutes, days, or months. So if the sentence "And a year passed." appeared, people inside will have lived a year in less than a second outside. The second season of Corrector Yui had the Com-Net marching at 256 times the speed of real time, allowing people to do tasks that would normally last days (or months) into a few hours. This is mentioned in a certain episode when Yui is required to finish up a self-published manga (which, Yui being what she is, forgets to do so). In Digimon Adventure, time originally passed very quickly in the Digital World meaning that the gang could spend several decades (or maybe centuries, Izzy calculated it in the last episode) in the Digital World while only a month or two would pass in our world. However, time in the two worlds were synchronized after the final boss was destroyed. Catnapped features a world, Banipal Witt, where an entire day there (measured in a series of balls and grains, manually reset, in a complex hourglass) is equivalent to three minutes in the human world. However, the time passing is inconsistent in the movie itself, so there's no real knowing if that correlation is correct. In Negima! Magister Negi Magi, Evangeline A.K. Mc Dowell uses miniaturized worlds contained within glass diorama spheres as alternate places to train or relax, such as the Resort. One hour in the real world equals 24 in the resort. Due to a spell cast by Evangeline, occupants must stay for a full day (one hour in the real world) before being able to leave. This device is the subject of an important plot twist during the Mahora festival arc. Once the rescue team crosses over from Equestria to Arcadia in Into The Hedge, they soon learned that in Arcadia, what may 'feel' like the passage of 24 hours might not necessarily be 24 hours, outside or inside Arcadia. In Aftermath of the Games this happens between the human world and Equestria. Whereas it's been twelve years in Equestria since Sunset first fled through the mirror, in the human world it hasn't even been a full two. Though now that the worlds are more permanently linked, time is synching up. In The Elements of Harmony and the Savior of Worlds, this happened to Earth and Equestria after the Rainbow Bridge collapsed — for Megan's family, it's been about two decades since the end of the original cartoon, while for Celestia, Luna, and any G1 characters still alive, it's been about 15 centuries. Once the Bridge is reestablished, however, time synchs up again. Comes up in I Still Haven't Found What I'm Looking For given that for years Harry Potter tossed objects through the Veil in an effort to understand just what it was. When he went through it, he found a cup of tea he tossed in shortly before an experiment accidentally sent him 200 years into the future; said tea was still warm. Meanwhile, in the nearly 20 years since, he's only found 10 of the 1,000 galleons he sent through and some of those were in the middle of trees several thousand years old. The animated Peter Pan and its sequel. Time moves slowly in Neverland, hence why Peter never grows old... but then how can a couple of Neverland days last only a few hours in England? Likewise in Hook. Peter promises to visit Wendy every spring, but his visits clearly don't occur at regular intervals. This is averted in the book. While Neverland has no seasons, and sunrises and such come and go whenever they feel like it, the relative time for people inside and outside is the same, and the children really are gone for months. While Peter's 'springtime' visits don't come at regular intervals, it's because he doesn't know/care how much time is passing, not because it isn't. In Jumanji: Welcome to the Jungle, this is the best way to describe the time flow between the In-Universe titular video game and real life. Players get sucked into the game in the form of their avatars and once the game is finished they return back to the real world in their normal forms at the exact time from which they started playing. Picard, Kirk, and Guinan all meet inside the Nexus within hours after arriving, even though Kirk and Guinan entered (and Guinan left) decades before Picard got there. Picard and Kirk also both exit the Nexus shortly before Picard entered in "real" time. We're explicitly told time doesn't exist in the Nexus. Possibly averted in Guinan's case, as the Guinan Picard sees is described (by herself) as being some sort of remnant/echo of the Guinan that left. In Thor: Ragnarok, time behaves oddly on the planet Sakaar, but how this works is vague at best. Thor and Loki end up there after being thrown out of the Bifrost wormhole, but Loki arrives weeks ahead of Thor despite them only being seconds apart. The Grandmaster notes that the planet has allowed him to live a very long time, suggesting time either passes slower there or people just don't age... but all the scenes back on Asgard appear to happen concurrently with Thor's plotline. In western folklore, fairy rings are often understood to operate like this. Step in one, and you could experience days, weeks, or months in the fairies' world while only having been gone from your own world for a short moment. Or, you could end up passing what seems like a few short hours with the fairies but return to your home and discover decades or centuries actually passed. Fairy magic is notoriously fickle. In Japanese folklore, there is a tale about Urashima Taro who, after rescuing a turtle who was a princess in disguise, he is taken by said princess to her castle, where they spend supposedly three years together there. When Urashima asks the princess to let him go back to the surface to see his friends and family again, she gives him a box that must never be opened. When the young fisherman tries to see his family, he is told that they died 400 years ago, which devastates him emotionally. Utterly hopeless, he opens the aforementioned box—which immediately makes him 400 years older—and dies instantly. It happens that the box was retaining his true age at that moment. In The Beyonders the relative rates of time between Earth and Lyrian are inconsistent. When Jason returns to Earth at the end of the first book he finds that a few more months have passed at home, and later an Oracle explains that it's hard to predict what time dimensional travelers will come out in, but thanks to her powers she knows that in five years the timelines will be synced. Rachel takes that opportunity to go back, knowing that her parents won't have seen her for five years and vice-versa. And a prophecy indicates that she'll later go on another adventure with Jason's (who stayed) daughter. This is how Madam Aisha's "Fairy Corridor" Authority works in Campione!. It opens a portal that sends her to some random place and time in the past where she can spend years to return only a few days or hours after she left, or spend only a handful of days and come back years after she left and everything in between. While she has no control over being sent into the past, she has some limited control over how long between when she left and arrives back in the "present" and deliberately legnthens the time to make her younger than her chronological age would suggest (despite being an immortal god slayer). In Roger Zelazny's The Chronicles of Amber series, the characters are not only aware of this effect when traveling through Shadow, but actually take advantage of it to heal up, recruit armies and train them in record time, and so forth. It is inconsistent between Amber and Chaos: Corwin fathers a child, who grows to adulthood in Chaos, in what to Corwin is days. On the other hand, when Corwin visits Chaos for a few minutes, weeks pass back in Amber. Chaos is...chaotic. The relative rate at which time passes varies from Shadow to Shadow. Depending on where you go, time in Amber might either be passing more quickly or more slowly than it is for you, though unlike Chaos it's mostly consistent for any given Shadow (if "any given Shadow" is a meaningful term). The Trope Namer is The Chronicles of Narnia series by C. S. Lewis. In most of the books, a number of people (usually children) travel between the "real" world and the fictional land of Narnia. Edmund is able to determine that the rule is: when you're in Narnia, no matter how long you stay there, no time passes in the "real" world; but when you're in the "real" world, any amount of time could be passing in Narnia. The Professor actually believes Lucy is telling the truth about her first visit to Narnia because her story makes use of this trope (with which he has some personal experience, as revealed in the prequel) without her realizing it. He says that if Lucy were really lying about Narnia, she would have hidden for a long time before trying to sell the story, rather than claiming to have been gone for hours when only a few seconds had passed. In the first book (the second chronologically in-universe), the Pevensie children age from young children to full adults (kings and queens, in fact) in Narnia and then are returned to Earth where they have been gone for no time at all and are still children. The next time they visit Narnia a year later in Earth-time, hundreds of years have passed there, and their previous exploits are the stuff of legend. It was shown in The Last Battle that things can work the other way round too; King Tirian sees a (two way) vision of our world, and the various heroes of the series, and minutes later Jill and Eustace appear to save him (he had been tied to a tree by the bad guys). In the "real" world, they had spent a few days formulating a plan to get back to Narnia and save him. Tirian is also astonished to find out that Digory and Polly were still alive in our world at the time of The Last Battle, since they were present at the moment of Narnia's creation. At one point, Aslan explains that he always sends children from Earth to the point in Narnian history when they're needed most. Basically, time passes however God wants it to pass. In Stephen King's The Dark Tower series, characters are at first able to jump between worlds at any point in either world's history, traveling back and forth through time at will. Later, there is revealed to be a Keystone Earth in which time always moves forward and you can never travel any earlier in history there than when you last visited ("no do-overs" is how the characters put it). Even then, it's explained that time generally moves faster in the Keystone Earth than the universe in which the majority of the action takes place, and periodically "lurches" forward in relation to it, forcing the characters to Race Against the Clock to get certain plot-necessary chores done. Most of this is handwaved as either the work of "ka" (destiny) or a glitch in the failing infrastructure of the universes or both. In Mikhail Uspensky's Dear Comrade King, the temporal relation between our world and Zamirye works like that. But wait, there's more! Turns out that a local wizard cast a Timey-Wimey Ball spell, so the speed of time flow in various parts of Zamirye also goes out of sync. So two characters from Earth enter Zamirye in the height of the Soviet rule, spend there some months and return after The Great Politics Mess-Up, right in the middle of the First Abkhazian Conflict. In The Demonata, time passes differently in each Demon Universe so characters from different times can interact and end up similiar ages. Also leads to odd events such as Kernel returning to his parents after being missing for a number of years but he hasnt aged at all. Brutha: He's been here for a hundred years? Death: Perhaps not. Time is different here. It is ... more personal. Brutha: Ah, you mean a hundred years can seem like a few seconds? Death: A hundred years can pass like infinity. This is how travel to the Nevernever works in The Dresden Files. Time generally runs faster in the Nevernever than on Earth, but it varies from one part of the Nevernever to another and sufficiently powerful faeries can deliberately influence the speed. Most of the time this detail doesn't matter to Harry and the time skip is never enough to add up to months or years. However, when his police officer friend is supposed to be working on a high-profile case, just a few hours in the Nevernever can add up to a length of time that's hard to explain to her superiors. In K.A. Applegate's Everworld, the main characters effectively live double lives, going between the Old World and Everworld whenever they fall asleep. The time between the two worlds/universes seems to vary each time, but usually not by more than a factor of a few days. This breaks down in the final book. The Pet Force series of Garfield books. The flow of time between the two universes (Garfield's regular universe and the Pet Force universe) is proportional (so time will pass in the mainstream universe but considerably more will pass in the alternate universe). This is usually a non-issue as Garfield and his friends return to their correct universe within the span of approximately five seconds but during the epilogue of one book, they are unable to return to their origin universe and Jon notices their absence. In The Girl Who Circumnavigated Fairyland in a Ship of Her Own Making, no time passes in the Human world for a Human in Fairyland, with occasionally cruel results like growing to adulthood in Fairyland and then being thrust back into an abusive family as a twelve-year-old. Adds a serious element of Fridge Horror to the more famous example of the Pevensies returning to England and becoming young again. In Hours, one hour of regular time can equal any amount of time in the Waving World, from tens of minutes up to many days. This is because the perception of time in the Waving World is based on events, not physics. Happenings of great import, such people dying, take up more real time than do mundane tasks. In the Incarnations of Immortality series, if a mortal stays for a day within Purgatory (where the mostly-immortal Incarnations live), a year will have passed for that individual back on Earth, unless a special dispensation is made. Normally this is not an issue, since most characters there are ghosts or the Incarnations themselves. But, in And Eternity one mortal uses it to her advantage, after the first time where she finds this out. In The Magicians, travel between Fillory and Earth works the same way, which of course makes sense, since Fillory is essentially a parody of Narnia. In Eloise McGraw's The Moorchild, "time runs different in the Mound", the Mound being the home of the Folk. A human who's lured in can stay for what feels like a season or at most a year, and then when kicked out discover that a few decades have passed and he has aged accordingly. In The Pendragon Adventure it's said on multiple occasions that "Travelers arrive where they're needed when they're needed" (or words to that effect); so time spent in one territory doesn't necessarily correspond in any meaningful way with time in another territory. Becomes a little strange when three of the territories are just different time periods in other territories. Not to mention how it's apparently okay to change things in one of those redundant territories, until it actually matters at the end of the series. The way of the timeflow in Stravaganza. Most of the time, it's a consistent one-to-one day ratio, with the only oddity being that day in Talia is equivalent to night in England. But from the first, readers know that the timeflow is much more unstable. Doctor Dethridge, who lived in the Renaissance and was the first Stravagator, regularly gets visits from Stravaganti from modern-day England because time has flown by more quickly in England. This is played to its heartbreaking conclusion when Lucien's entrapment in Bellezza for like, two days, translates into a three-week coma in England  coinciding with a resurgence of his brain cancer. His parents, having concluded he's never waking up, decide to cut off his life support. Wesley, Kurt, and Lisa accidentally venture to the kingdom of Anthropos in another world, and stay there some weeks helping to free it from the forces of darkness. When they return to the 'real' world, only a few hours have passed. After several months have passed in Canada, the portals to Anthropos' world open again. Venturing there in pursuit of their lost cousin, the children find thirty years have passed there. SyFy Channel miniseries Alice: Wonderland appears to operate on Narnia Time. Doctor Who: In "The Girl in the Fireplace", the time portals between the future and 18th century France work like this. But it isn't consistent, leading to a Tear Jerker ending. The Flash (2014) has had inconsistencies in how time works when traveling between universes. When traveling to Earth-2, they are able to a timer for how long they have to get back, but when traveling to Earth-38 (Supergirl's Earth) Barry's gone for a full day while seemingly no time has passed on his Earth. Later, when he and Cisco visit Earth-38 it "takes a few tries" to get into her Earth. Those tries happen back to back for Barry and Cisco, but days apart on Supergirl's Earth. A time travel variant occurs in the Lost episode "The Constant". Desmond is going through bursts of Mental Time Travel that makes him go from 1996 to 2004. While things are always in real time in the present day, the past travels at a certain time encompass bigger intervals (Desmond is talking to Daniel, returns to 2004; when he goes back to the past, Daniel reveals Desmond blacked out for more than an hour). In MythQuest, one of the characters travels into their computer and re-enacts a myth while the other watches. Time appears to be completely variable, because some myths last days, while the person watching has only been seeing the myth for a few hours. 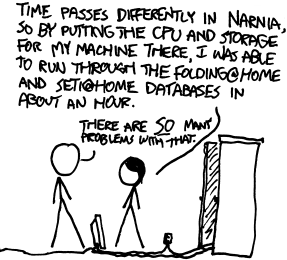 The Bajoran wormhole in Star Trek: Deep Space Nine runs on Narnia Time. Usually characters have exited the wormhole to find that the same amount of time passed both inside and outside. The aliens who live in the wormhole are explicitly stated to not even understand what time is, however. As a result, they have caused a Bajoran poet to skip a hundred years of "real" time in the matter of subjective seconds. Additionally, one of the aliens left this realm to directly cause the conception of the main protagonist, decades before they met him. Inverted in the Star Trek: Voyager episode "Blink of an Eye"; a planet's time passes 58 times faster than time on Voyager, advancing their civilization from Stone Knives and Bearskins to an advanced space-faring society in a matter of days. One inhabitant of the planet survived his time on Voyager, but returned over a century later planet-time to find all his acquaintances long dead of old age. This is how time in Arcadia works in Changeling: The Lost Two children might be kidnapped on the same day. One spends 30 years in Arcadia, and returns to find that it's only the next day. Another only spends a week in Arcadia, but comes back after 60 years in the real world. This is one of the major obstacles the Lost face when trying to regain their lives. Warhammer 40,000 example: As if The Warp wasn't bad enough, there have been stories of heroes being imprisoned in places the Warp bleeds through into reality, and finding that they'd been missing for hundreds of years when they escape. On the other side of things, ships that come to the aid of distress signals occasionally find themselves under attack and sending the signal they'd followed in the first place. One Ork Warboss, looking to dual-wield his unique weapon, managed to ambush and assassinate his past self this way (the Waaagh! collapsed in the general confusion). Even on an an uneventful trip through the warp, timekeeping relative to the materium is a pain in the neck. Because all communication also uses the warp, the further a planet is from Terra the less certain they are of the actual date; the calendar the setting uses actually accounts for this. In Minecraft, time only passes in the dimensions that have players in them. If you are in the nether, you crops won't grow and your items won't smelt in the overworld. Time works as normal in multiplayer if at least one player each is in the overworld and nether. In Ultima, time passes faster in Britannia than Earth, though the ratio seems to be random; the general explanation is that the Avatar is called to the time s/he is needed most. The presence of time travel just serves to confuse matters further. This doesn't explain how the Avatar's companions, Lord British, and Blackthorn can live for centuries (OK, Blackthorn spent time on Serpent Isle, but still). All over the place in Super Robot Wars Original Generation and Endless Frontier, when travelling between the Shadow-Mirror, OG-verse, and the Frontier itself. Axel was the last to leave the Shadow-Mirror Universe, but ended up in the OG-verse months before the rest of the force. The neverland was one of the first to leave, and landed in the Frontier centuries after an entity that ended up there months after the Neverland's teleport. Fate/Grand Order: Explicitly mentioned by Da Vinci in the second part of the game, in regards to jumping between the real world and the "Sea of Imaginary Numbers". The "rate" of time between the two realms always fluctuates, although time would usually pass slower in the real world. In The Dreamland Chronicles, the Dream Land operates on Narnia Time. When Alex falls asleep he goes to Dreamland, and when he wakes up some time passes in Dreamland before he falls asleep again. However, the amount of time that passes in that time is explicitly declared as random. Sometimes nearly no time passes like when he is falling with Felicity on his back, whereas sometimes several hours passes. The general amount of time that passes must average out though, because at the beginning of the story when Alex hasn't been to Dreamland in years, a similar number of years have passed for the inhabitants. In Effulgence, worlds are time synced as long as information transfer is going on between them, but when there isn't they can get massively desynced, sometimes with hours passing in one world and years or even decades passing on another. Entering Milliways through a normal door pauses time in a person's origin world until they return, unless they go to another world and are never planning to return to the original. In Danny Phantom, portals between the Ghost Zone and the real world occur naturally, opening and closing at random, and are capable of leading to anywhere or anywhen. The only exceptions are the two artificial portals, which are generated and held open through technological means. The Neitherworld, where Beetlejuice spends his days, appears to run on a very different timetable than the Outerworld. Lydia is often with Beetlejuice for hours or even days, and yet she's never shown to miss any school or have her absence noticed by anyone. Although there is no time or interdimensional travel in Bojack Horseman, Narnia Time is repeatedly played for laughs as part of a recurring gag. It goes like this: Bojack becomes depressed and goes on an alcoholic or drug fuelled bender, then he'll start a conversation or say he's about to perform a simple task which would only take a short time to perform, and the background will change to show the task or conversation has been completed. And then his companion will look at him strangely, explain that a much longer period of time has passed, and either briefly summarize his drug-fuelled antics or tell him that he's been missing for weeks or months.